An inspiring guide to creating all different types of gardens, from formal to natural, eclectic and modern to Oriental and Mediterranean. 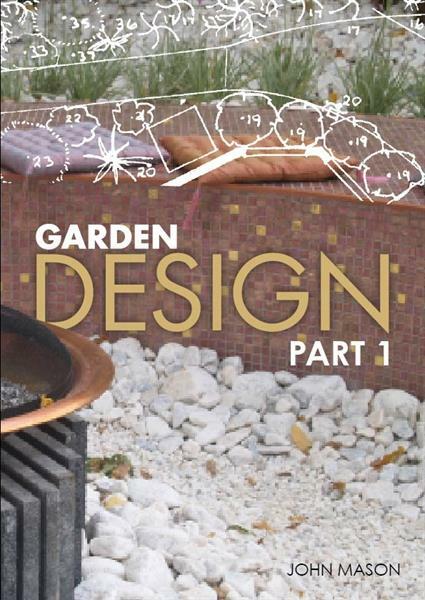 A stand alone book or an excellent companion to Garden Design Part 2. What variety? ; Low maintenance plants; Which plant? This book brings together a collection of articles on Garden Design written by John Mason over several decades of visiting and photographing gardens, writing and teaching; and creating gardens. The garden is your child’s most important playground, and a lot of what is learnt about life is learnt playing there. Building cubbies or tree houses, digging holes, damming streams, etc are all very positive and worthwhile forms of play, but at the same time they are activities which are best tempered with commonsense if permanent damage to the backyard is to be avoided. Never discourage children from playing with their environment, but do educate them to understand the implications of what they are doing. 1)Animals - everything from microscopic protozoa, through snails and spiders to the more complex vertebrates such as birds, lizards, dogs and cats. 2)Plants - again, from the simplest microscopic bacteria, to the mosses, fungi and ferns, shrubs and trees. Play can be centred around complete living plants (e.g. growing a garden) or parts of plants (e.g. arranging flowers or making a whistle from a piece of bamboo). 3)Earth - stones, rocks, sand and soil, etc are all commonly used in play. Fences and walls can be used for murals, or a lean-to cubby house. Different levels - mounds, slopes, embankments, steps, cliffs. Different surfaces - grass, earth, sand, gravel, mulch, rubber. Things that enclose spaces - fences, walls, cubbies, other buildings. Water - ponds, fountains, streams, drinking fountains. Landscape features - statuary, bridges, pergolas, arbours. Furniture - seats, tables, rubbish bins, BBQ’s, lighting. Plants - hedges, mazes, topiary, trees, windbreaks. Play structures - slides, swings, see-saws, climbing frames. Other play facilities - games courts, rebound wall, bike trail, skate area, animal enclosure, etc. When catering for kids you have the job of selecting and combining these components to achieve an appropriate environment which will enhance play in the area being designed. What are the children’s ages? Toddlers enjoy exploring and learning about their physical surroundings. It is important to include variety in textures, smells and surfaces. Older children interact more with each other so the backyard needs to be designed to allow them to play with each other rather than with things. How much will the garden be used? Things which can only be used by one child may create conflict. Crowding makes accidents more likely so design safety becomes more critical. Leave room around playground equipment and make sandpits big enough for all the children. Heavily used play areas need stronger construction and more frequent maintenance. How much time will be spent in the garden? A child’s attention span is short. Some play activities are only suited to playgrounds which are to be used only occasionally or for short periods of time. Don’t expect a child to use the same swing all day every day, but they might use a sand pit more often. Plants have too often been underused or misused in playgrounds. Above all, avoid using poisonous plants in areas where small children play. It has been said that more than one third of commonly grown plants have some toxic properties. Children below the age of 5 or 6 frequently place parts of plants in their mouths. They can become play structures (providing mazes, cubbies, climbing etc). Trees should be selected according to both strength of timber (i.e. ability to withstand use by children), and disease resistance (e.g. a birch which is highly susceptible to internal rots can become unsafe for climbing). Prickly or poisonous plants are also unsuitable. Cubby Houses are very important in a child’s early life. They provide children with a place of their own where they can do things which can’t be done anywhere else (even in their bedroom). They don’t have to be a makeshift eyesore in the garden, but be sure to remember it’s the children’s building and they must be the interior decorators. If the parents build, buy or arrange everything inside the cubby it will stop being the child’s cubby but reflect the parent’s personalities. Safety is also an important factor. A well-constructed, well-finished cubby will not only look good but will reduce the likelihood of injuries that so often occur in poorly constructed cubbies. Playground equipment must have soft surfaces underneath them. The most lethal surface under any play structure as far as children are concerned is concrete or asphalt. Hard surfaces are useful in open areas for playing ball games, but should never be used under equipment where children might fall. Sand or organic mulch can be ideal but it must be thick, and it must be maintained.